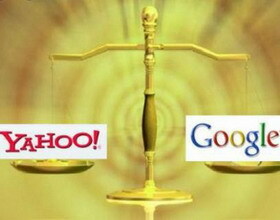 It wasn’t until reading The Guardian’s “Second Sight” by Ben Hammersley that I realized that Yahoo! had launched its own version of Google labs. This of course led me to next.yahoo.com and a series of interesting links related to what Yahoo! had been doing this past year, as well as what they were drafting for their new playbook. I admit it. I have been overwhelmed–perhaps “googlewhelmed”– by the work and press that Google has been getting. But I think I can agree with, or at least appreciate, when Hammersley writes that Yahoo! may also be a contender, if not even a winner(? ), in the game of search services. “Search services.” Doesn’t do it justice. What — what do we even call this work? Search engines are so much more now. “Portals” sounds too weak and too limited, and I don’t know that I’ve come across a term that encapsulates the digital “wholeness” of what they’re trying to accomplish with desktop search, blogging, multimedia sharing, mapping, messenging, API development, etc.,. Perhaps Yahoo’s “360 degree” concept comes closest. Thinking about the possibilities certainly causes me to spin. Thanks to Stephen, I did sign-up for Yahoo!360, although as you can see, I haven’t really had the time to explore it beyond the very basics. If anyone wants to experiment, let me know by leaving me a comment on this blog and I’ll gladly send you a referral (at last check, I had no less than 99 left so need to rush).